The Breakers Palm Beach has mastered the delicate balance of offering a legendary experience while always surprising with something new. This approach extends to its retail strategy, which the resort strives to constantly evolve to cater to the personal needs of guests, club members, and local residents. 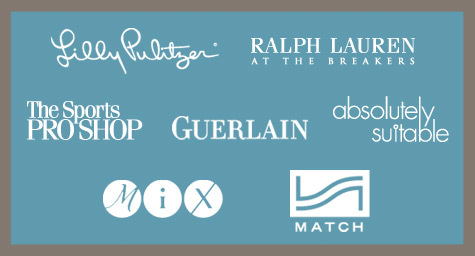 In addition, The Breakers works closely with buyers to continually update its retail options, as well as with MDG Advertising to market the resort as a contemporary shopping destination. The Palm Beach Daily News recently reported on how this retail strategy is presenting great success. The Breakers offers a unique collection of world-class boutiques and specialty shops, all wholly owned and operated, from recognized brands like Ralph Lauren and Guerlain, to signature stores like Absolutely Suitable, The Breakers News & Gourmet, and the Signature Shop. Shoppers appreciate the wide array of clothing, jewelry, fragrance, leather goods, lifestyle accessories, resort wear, children’s apparel, gifts, and more. In recent years, their retail strategy has been refined to move away from the industry standard of leasing arrangements with fashion houses, which result in the need to share both control and profits. Their current focus is on combining branded merchandise with their own unique concepts to provide customers with an exclusive, one-of-a-kind shopping experience. The resort’s most recent retail evolutions have included the refocusing of one major boutique and the addition of two. In its Absolutely Suitable swimwear shop, the resort has expanded the store’s offerings in response to customer demand. The shop has tripled its variety of sunglasses, brought in more poolside apparel, and added more casual handbags and totes. One of the most highly anticipated debuts was the opening of Lilly Pulitzer® at The Breakers, featuring the whimsical and colorful style of the brand that captures the Palm Beach lifestyle. The boutique features a large selection of women’s apparel and accessories, as well as men’s neck ties. The other exciting debut was Match at The Breakers,® a shoe salon featuring a collection of contemporary and designer resort-style footwear. The boutique boasts an impressive selection from designers and labels that are difficult to find anywhere else on Palm Beach. Most of the styles are designed for women, but there also is an array for fashionable men. By constantly evolving and catering to guests’ needs, The Breakers has expanded its appeal beyond a resort to become one of Palm Beach’s premier shopping destinations. To discover innovative marketing strategies for your brand, contact MDG Advertising. MDG Advertising handles advertising, collateral design, and integrated marketing for The Breakers Palm Beach and its collection of restaurants, boutiques, Spa, Ocean Club, Breakers West, and the Phillips Point Club. A full-service Florida advertising agency with offices in Boca Raton and New York, NY, MDG specializes in developing targeted Internet marketing solutions, exceptional creative executions and solid branding and media buying strategies that give clients a competitive advantage. Our core capabilities include print advertising, branding, logo design, creative, digital marketing, media planning and buying, TV and radio advertising, public relations, Web design and development, email marketing, social media marketing and SEO. View MDG Advertising’s creative marketing portfolio.